After recovering the Eye of Kilquato the Wardens returned to the United States via an uneventful plane ride. Once back in New York City, the Wardens convened for a quiet Catholic ceremony honoring their fallen friend, Father Cameron Dovenney, who was slain by a crocodile while recovering the Eye. Afterwards they retired to the Warden’s headquarters in Manhattan where they contemplated their mission. They had secured the eye and defeated the crocodile cult that had been using it toward nefarious ends. They were also now comfortably well off, thanks to the $10,000 payout that the Metropolitan Museum of Art had given to each of them. Puffing slowly on his pipe, their sponsor — Sir Arthur Boundless — reflected that while the mission had cost them the good father, he had died fighting the good fight, and the Wardens were pleased with the outcome. It was a sad day, but still a victorious one. Shortly after the memorial service, Rikard Greystone received a call from his former mentor, Hank McKay. McKay took Greystone, then a rookie with the NYPD, under his wing and taught him how to be a beat cop. They parted ways two years earlier: Greystone deciding he could do more good as a private detective, McKay being promoted to lieutenant. The lieutenant, knowing that his old student had gone into private investigation and had friends who were experienced in solving unconventional mysteries, rang up Greystone. McKay explained that a “ghost ship” had crashed into one of the piers down at the harbor. The first men on board found no one alive onboard the rusting hulk, though they found plenty of evidence of foul play in the form of blood smeared throughout the ship. The crash led to a jurisdictional dispute between Precinct 1, the Harbor Patrol, the Coast Guard and the FBI, all who wanted a piece of the crime scene (yet no one was over-eager to set foot aboard the cursed wreck. He gave Greystone and his friends clearance to board the ship, but explained it was only a matter of time before the bureaucratic mess cleared up and the feds took over. Greystone, the talented mechanic Hividar Macid, the daring pilot and WWI veteran Archibald Buchanan, and mercenary McGinnis headed down to the docks. Once they arrived there they found patrolmen guarding the approach to the “ghost ship.” At first the patrolmen tried to dismiss the investigators, but Greystone impressed upon them that the lieutenant would be most displeased if the Wardens were turned away. Looking nervous, the officers agreed to “take a walk” and leave the wreck to the Wardens. They soon learned what was making the police so nervous: someone else was aboard the ship. Several someones. The ship itself was some sort of trawler, with two masts, lots of rigging, a sizable cargo hold, a central boiler and smoke stack, and even a place for a seaplane to be stowed. The ship was badly battered from the collision with the dock, which caused it to rest at an unnatural angle and caused the deck of the ship to tilt 20 feet above the dock below. The vessel was badly rusted, and her name could not be clearly made out. As the Wardens approached they caught sight of shadowing individuals moving about on the deck. This individuals, catching sight of new arrivals on the dock below, moved to repel boarders. Greystone fired a grappling hook which sailed over the ship’s railing. he secured the rope at the other end of it, and the Wardens began moving aboard. In the melee which followed Greystone, who swore never to take a life, used his boomerangs to take out one of the combatants. McGinnis and Buchanan were under no such moral restrictions, and happily exchanged gunfire with the interlopers. Closer examination of these shadowy men revealed that two were of Asian decent while another was a Caucasian. All were intent on killing those who boarded the ship, shouting “No one interferes with the Red Hand!”, but they turned out to be the least of its dangers. The fight was interrupted by a terrible stream from below decks, followed by the awful, wet sounds of a body being torn in half. 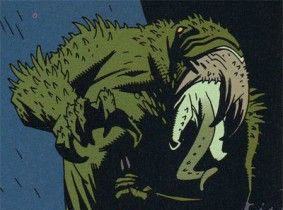 Two huge, monstrous creatures emerged from the cargo hold, looking like something spawned from the Abyss itself. Both sides took potshots at the creatures, but they soon decided to flee the ship by diving into New York Harbor. The firefight was quickly concluded after the emergency of the creatures, with all but one of the shadowy thieves being killed. They bound the survivor in the cargo hold with Greystone’s manacles, then set about exploring the ship. They found a fortune in mining and drilling equipment in one hold, then discovered sawdust-packed crates filled with rock samples and melting ice cores in another. In the ship’s aft hold they found the remains of a half-dozen 9′ tall, 4′ wide wooden crates … crates that had very clearly been smashed to pieces. More unnerving was the thought that they might have been smashed from the inside; they were clearly large enough to hold the humanoid horrors they encountered on the deck. While they investigated the hold the “Red Hand” survivor escaped from his manacles and tried to take down one Buchanan. McGinnis, seeing a clear and present threat, decided to forgo Greystone’s mercy, and killed the attacker. 1/21/34 – My dearest Clara … it has only been hours since our final kiss on the docks, and yet I miss you terribly … The men are eager for the adventures our quest to the Antarctic will undoubtedly yield. I, of course, share this excitement. 10/3/34 – My dearest Clara … The ice mountains loom ever larger and closer to the Centaurus. This morning Midshipman Essex caught sight of the Royal Society Range. We have arrived! 11/1/34 – My dearest Clara … The hunt is on! We have scouted the known quantities of the Scott and Bellemy Islands, and move our hunt to the Amundsen Sea. I know, with all my heart, mind, and immortial soul, that the object of our quest is near. 11/11/34 – My dearest Clara … Triumph! Victory! Glory to the King and God in all things! We have found it! Shrouded in ice and obscured by mists but we pierced through that natural veil and found the island I knew would be there. I shall name it Clarus Island in honor of you my dear! 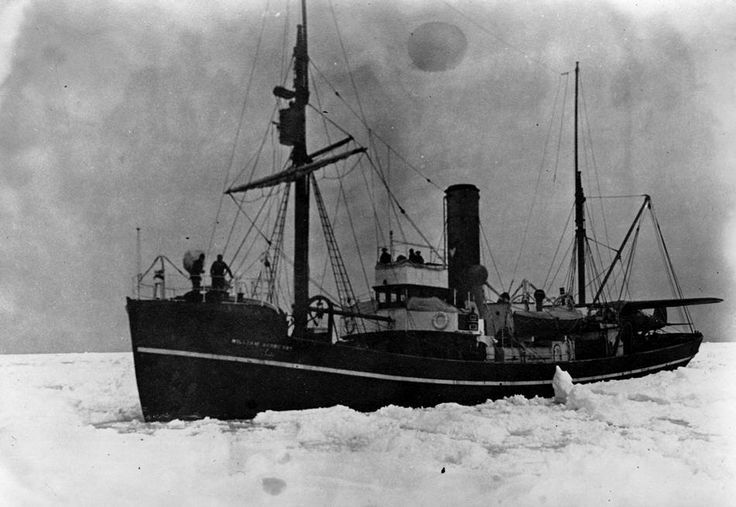 12/2/34 – There are wonders in the ice. Forget Shackleton and Scott; it is the name Roberts that history will never forget. I have had the men take samples of the find, and they will transform our understanding of mankind! 12/24/34 – It is Christmas Eve and though my heart and body long for your embrace, my mind is filled with the possibilities of our latest find. History will not merely remember me, it will be rewritten in light of what we have found here. 12/25/34 – Deeper still. So far from the memories of light, to a place forsaken by the sun. The earth, she yields up her mysteries to me. We have found something more wonderful still, something tha tmakes the discovery of the neanderthal a mere foot note to history. It will take time to understand, but it is time I will soon have. 1/25/35 – It is done. We have learned all that we can on this expedition. We must return home so that the world so that its re-education can begin, and then begin planning our return to this place. I love you, sweet Clara, with all my heart, but history will soon be my mistress! 2/7/35 – Words fail me. Why do words fail me? Before it made sense. Before the words flowed. Now … I find they dance to the remote corners of my mind and refuse to be commanded. I shall find the words. I shall find them, and bind them once again to my will. 2/9/35 – Yal dran tor fa millsterant. Ack der mar talvern zal frock, mordalsen’tis. Tergal dis Ra! TERGAL DIS RAY! After investigating the wreck the Wardens checked in with Lt. McKay. They told him about the Red Hand, which McKay told them was a prominent triad gang operating out of Chinatown. They also mentioned the strange fishmen creatures they encountered. Rather than cause a panic by saying that monsters were running amok in New York Harbor, Greystone suggested that the police tell folks that there were bears loose in the warehouse district and that their patrolmen should be on the look out for the beasts. McKay was skeptical, but lacking a better plan, agreed to follow the Wardens lead.